The Internet Of ... Animals(?)! Have you ever thought of your dog being connected to the internet? How about birds? whales? bees? If humans connect everything (themselves and things like lamps or refrigerators), will they start to connect animals to the internet as well, and how will it look like? This bold adventure started a few years ago and has been interactive in many ways, be it in workshops, exhibitions or even at maker fairs. It has realized results such as an award-winning design study (the Wifi Chicken), dogs that send emotions over the Internet, and other crazy(?) projects. Some strange, some scary, some beautiful, all fascinating. But the deeper we dive, the more we find a touch of inevitability, urgency and complex meaning also for humans. However, you do not need to be at a particular event. You can contact, interact, be part at anytime and from anywhere! If you want to know more or be part of this exciting adventure into the future please click on contact link at the top of the page. The project is non-commercial, so we cannot produce documentation at this time. Nevertheless, in recent years there have been a wealth of activities of great value to the participants. You found and will find the project at individual exhibitions, workshops, and events (Barcelona, Frankfurt, Berlin), and events like Bended Realities Offenbach, Make Rhein Main, Webweek Rhein Main, maker faire Hannover, maker faire Barcelona,. 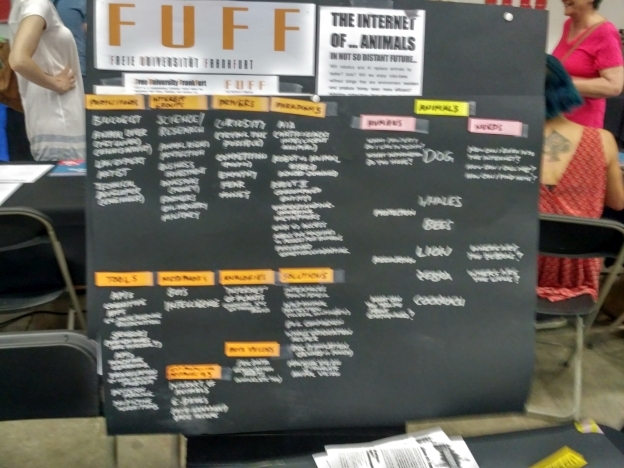 Much better: call or write to FUFF and we will find the best way how to connect with the project.